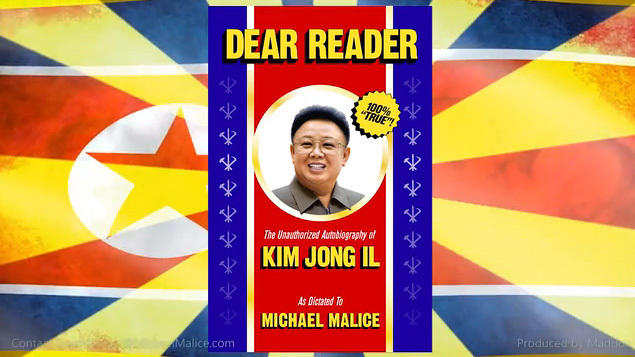 Dear Reader: The Unauthorized Autobiography of Kim Jong Il is an upcoming biography of the late North Korean leader Kim Jong-il by author & professional ghostwriter Michael Malice. To write the book in Kim Jong-il’s own words, Malice is drawing on a collection of English language North Korean propaganda books which he collected during a trip to North Korea. Malice is raising funds for the project on Kickstarter. He expects to complete the book by October 2013. This will be the best book ever written. Welcome to the bizarre world of the north Korea (since Korea is one nation divided by American Imperialism, we keep the “n” lowercase). It’s a nation where politics is religion, and religion is the worship of an odd little man by the name of Kim Jong Il. It is a notoriously reclusive and closed nation, one whose inner workings can only be guessed at by outsiders—until now.